At the Common Market, we pride ourselves on contributing to our local economy. But what exactly does that mean, and how do your purchases support the Frederick community? Let’s take a look. For us, “local” refers to businesses that are within 150 miles of the store. Products may be made, distributed, or a combination of both from the retailer to be considered local. We currently support 57 local businesses and 50 local farms. That means we are consistently purchasing products that are within 150 miles of the Common Market and making them available to you in our store. Currently, local products make up 23% of our sales. Buying local also means your money stays in the community, through employee wages and money spent locally. The same cannot be said for chain retailers. 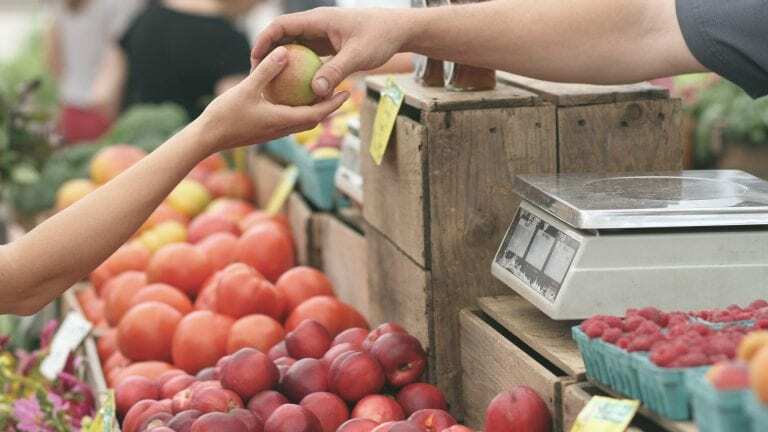 In fact, for every $1 spent at the Common Market, 37 cents is reinvested locally, compared with 15 cents reinvested locally for items purchased at a corporate chain. Your money also stays local when you use a reusable bag when you shop. Our Bring-A-Bag For Change program donates 5 cents to a nonprofit of your choosing for each reusable bag through the green token you receive at checkout. Since 2007, the Common Market has raised over $170,990 for local nonprofits, ranging from environmental to pets to children and families. Choosing the Common Market is more than choosing clean food. It’s choosing a healthy local economy, where local businesses and people can prosper.